Any good landscape designer will tell you that in designing your garden the most important thing is to create a space that meets your personal needs. If you’re looking at your garden designs and wondering how to create a relaxing and nature friendly environment, what could be better than deliberately encouraging butterflies? They epitomise everything about a quiet, peaceful space and are of course in desperate need of protecting. Attracting butterflies to your garden comes down to providing them with their ideal habitat. This ensures that these pretty critters have everything they need to survive but also encourages them to breed. Designing your garden to attract a variety of species requires the careful selection of a variety of plants. The garden design can be as eccentric or simple as you wish. However, many of the appropriate plants will line borders beautifully and create a rustic, cottage garden effect perfect for immersing yourself in on a warm day. Butterflies particularly love sunny, south facing areas, so tactful garden design will help to make the most of the few sunny days we are occasionally blessed with. That’s not to say gardens that don’t face south can’t attract more butterflies. There are many other important factors that need to be considered. That tactful garden design will also help in ensuring that non south-facing gardens make the most of the areas the sun does grace with its’ presence. So what types of plants should you be including in your landscaping plans? Heather, cornflower, marigolds and even thistles should attract a range of different butterfly species. Of course it’s important to make sure that the soil type in your garden suits the plants that you include. Heather for instance often prefers moist, acidic soil (hence the large quantities of it – and butterflies – on heathland.) If the cottage garden effect is something you are aiming for why not include a buddleia or two? The gentle pastel shades will contrast beautifully with the vibrantly coloured butterflies they will attract. The painted lady, red admiral and peacock butterflies are all fans of buddleia. Lavender on the other hand will attract smaller butterflies such as the common blue. Designing areas of your garden that will provide shelter will also help in creating a haven for the butterflies that come to visit. (And make them more likely to stay!) Many butterflies actually appreciate the nectar found on dandelions. This fits in nicely with creating shelter. Long grass and meadow type areas of your garden will provide that all important shelter for the insects to hide from windy conditions. It also means that you can deliberately design your garden with areas of uncut grass; having to spend less time mowing the lawn can only be a benefit! 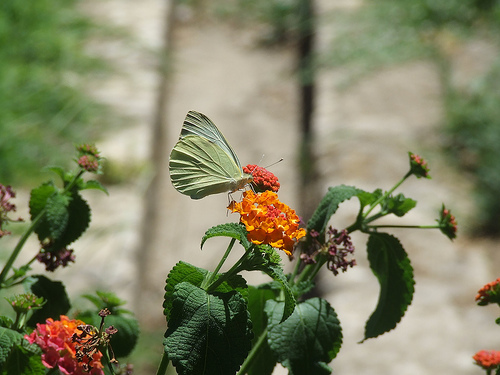 Deliberate landscaping that includes areas such as these will also result in micro-climates producing not just sheltered areas, but warmer areas for butterflies on those more than frequent rainy days. Landscape design doesn’t have to be complicated. Very often the simplest of techniques can produce wonderful results. Wiltshire-based Garden design experts Rumbold-Ayers have contributed this guest content. To hear more on landscape and garden design in Wiltshire, be sure to check out the Rumbold-Ayers website.